It might sound too good to be true – but Fisker is working on an electric vehicle battery that can charge up to 100% in just one minute. They’ve reportedly made a breakthrough in solid-state batteries – and their technology could allow an EV to travel 500 miles after a single charge. Designer Henrik Fisker relaunched his EV venture last year, and since then he has teased the 2019 EMotion and started accepting pre-orders this past summer. Now the company has filed a patent for a groundbreaking solid-state battery. Electrek said while they’ve been dubious about some of the claims attached to the EMotion, there could be some credibility behind the battery as the effort has been helmed by Fabio Albano, co-founder of Sakti3 and Fisker’s vice president of battery systems. The first EMotions will employ lithium-ion batteries similar to those in other EVs, but Fisker aims to have their solid-state battery production grade ready sometime around 2023. The company could show their first working prototype of the technology at CES 2018 in Las Vegas in January. Elon Musk Semi- Truck The Future Or Fantasy ? And Musk promises production will start in 2019. The big rig, which Musk unveiled at SpaceX’s Hawthorne, California headquarters Thursday night, is just the latest step in his mission to make humanity forget about planet-killing fossil fuels and embrace the gospel of electric power. That is, of course, if he can convince the trucking industry it’s time for a new way of moving stuff around—and if he can actually make the thing. Musk believes that going after the big boys is the best way to have a real impact on climate change. In the five years since Tesla started producing its Model S sedan, it has sold about 200,000 cars. The US has more than 250 million passenger cars on the road, making the impact of this, roughly, zero. Even if Tesla scales up production of its “affordable” Model 3 sedan, it will still be a very long time before the Silicon Valley automaker can change the way humanity moves about enough for any dip in emissions to register as more than a blip. Trucks offer a more effective way to do that, because they are particularly toxic. “Heavy-duty vehicles make up a small fraction of the vehicles on the road, but a large fraction of their emissions,” says Jimmy O’Dea, who studies clean vehicles at the Union of Concerned Scientists. In California, that category (which includes buses as well as trucks) accounts for 7 percent of total vehicles, but produces 20 percent of transportation-related greenhouse gas emissions and a third of all NOx emissions (those are the ones linked to asthma attacks and respiratory illnesses). Every truck you move with electricity instead of diesel has an outsize effect on the health of the planet and everything living on it. 18-wheelers are the ultimate force multiplier. Musk has done the math. And while lots of players are moving into electric trucking space, none have the star power of Tesla, the kind of clout that makes the whole country pay attention. From the outside, the carbon fiber cab is all smooth lines. Aerodynamics are a real big deal when it comes to fuel economy and making every electron count, and Tesla promises the Semi will cut through the wind more efficiently than some sports cars. Look inside the cab of the Semi, and there’s no doubt Tesla knows how to (re) design a vehicle. Like the famed McLaren F1 sports car (Musk owned one until he crashed it while driving around with Peter Thiel), the driver’s seat is now in the middle of the cab. (There’s a jump seat behind it, to the right.) Because it didn’t need to build around a bulky diesel engine, Tesla made the nose of the cab a vertical slab, and the main seat is so far forward, you can see the ground just in front of the vehicle. In a design touch that recognizes that truckers are human beings, there are overhead bins for storing stuff, and at least four cup holders. The cab is about 6’6” tall, so most anybody can stand up inside. The suicide doors stretch from the bottom to the top of the cab, making access extra easy. 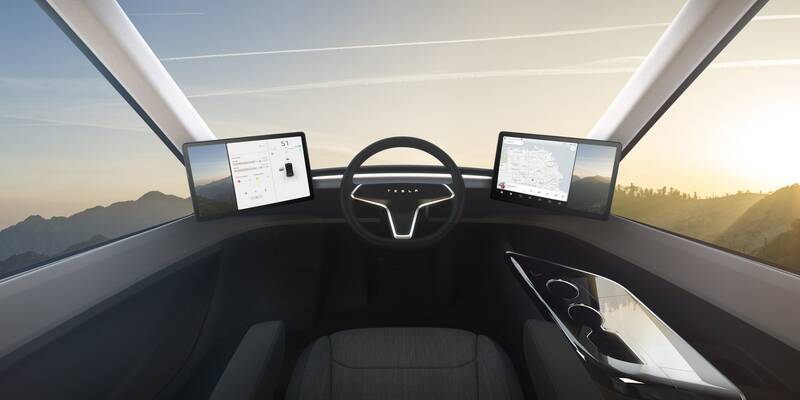 The human in charge gets two 15-inch touchscreens, one on either side, to handle navigation, data logging (for hours of service and the like), and blind spot monitoring. The only button in sight operates the hazard lights, everything else is done via one of the screens, or the two stalks coming off the three-spoke steering wheel. Tesla piled on the safety-related bits, too. The battery is reinforced to keep it from exploding or catching fire or whatnot in the event of a crash, the reinforced windshield glass shouldn’t chip or crack, and onboard sensors will look for the signs of jackknifing and adjust power to the individual wheels to keep everything in line. And of course, the truck gets the Enhanced Autopilotfeatures that let it drive itself on the highway, staying in its lane and a safe distance from neighboring vehicles. That means radars built into the front of the vehicle, and cameras all over the place, including in a pair of fin-like protrusions on the upper rear bit of the cab. The battery—whose size Tesla declined to disclose—takes up a space about three feet high, and stretches from the front wheels to the second pair. Behind the cab sit four electric motors, the same kind that power the Model 3, two dedicated to each axle. Extrapolating from an EPA document that says a single Model 3 motor generates 258 horsepower, that gives the Semi 1,032 ponies, twice what you get in most diesel trucks of this size. But in trucks, it’s the torque that really matters—another figure Tesla won’t reveal—but electric motors are champions when it comes to accelerating from a stop. That’s all great, but Musk still has to sell the thing. And while selling things has never been his problem (half a million people have reserved the Model 3, after all, and thousands of people ordered one before they had seen the prototype, had the specs, or knew the final price) truckers are a more difficult audience. Plenty of companies are open to new solutions, says Anne Goodchild, who runs the University of Washington’s Supply Chain Transportation and Logistics Center. But they’re not big on experimenting. “There are few who will be eager to be testing that out on their day-to-day operations,” she says. These are not early adopters; they do not go for cool. They go for total cost of ownership, which accounts for everything from upfront cost to fuel to maintenance to downtime. “We have to provide a product that in essence allows them to make money,” says Darren Gosbee, the head of advanced powertrain engineering at Navistar, a truck and bus manufacturer. Tesla’s big rig should have an advantage in fuel costs (electricity is pretty much always cheaper than dino juice) and maintenance, but downtime could prove a problem. Musk promises chargers that can add 400 miles of range in 30 minutes, but that sort of fast fill-up power requires specialized infrastructure. Even if Musk can get those stations built at enough points around the country to make a few routes workable, drivers will spend more time stopped than they would in a diesel-powered semi, and that’s a disadvantage. Perhaps the biggest question here is why Tesla is going after the long-haul market. When it comes to battery-powered big rigs, Gosbee says, “the worst application is one that basically sits at 65 mph and just drives.” Going across states or the entire country demands sprawling charging infrastructure, and highway cruising eviscerates the advantage you get from regenerative braking. “Your best application is a vehicle that doesn’t travel a great deal of distance and has an awful lot of stop-start maneuvers,” Gosbee says. Meaning trucks that wander cities, making deliveries and pickups. These wouldn’t benefit from the current, highway-focused iteration of Tesla’s self-driving tech, but they have lots of benefits for electric propulsion: They don’t go that far, they can charge at the same place every night, they stop constantly to can recoup lots of energy, and the diesel trucks doing that work now do their polluting where the most people live. Yet Musk promises economics over which truckers should salivate. On 100-mile routes, the Tesla Semi will cost just $1.26 per mile to operate, compared to $1.51 for diesel trucks, he promises. How he figured those numbers isn't exactly clear—and he didn't say how much the truck itself would cost, so it's hard to know how long it might take to amortize the (likely) hefty price tag. But wait, you say. You’ve been following the Adventures of Elon lately, and you have another question: How on Earth does this man think now is the right time to start building an entirely new kind of vehicle, for an entirely foreign industry to the one he knows? Production of the Model 3—the $35,000 sedan that marks Tesla’s attempt to become a real automaker—is months behind schedule. The company’s stock has slid south in recent months, and in the meantime it is facing lawsuits over alleged sexism and racism. Is now really the time for a truck? Maybe not, but that’s never stopped Musk from doing anything. This is the man trying to move humanity to Mars, start intercity rocket travel, avert the robot apocalypse, destroy traffic with networks of tunnels, and pack everybody into tubes where they zoom about at supersonic speeds. At the same time. Throwing a few trucks on the pile doesn’t make a huge difference. And if he can pull it off, he’ll be one lumbering step closer to saving us all. The bidding went so high, and so fast, even the auctioneer didn’t know what would happen next. History was made on West 49th Street on Wednesday night. It started with a letter and a number, 9B, an otherwise meaningless alphanumeric code that now represents the largest sum ever paid for a work of art in history. Lot 9B at Wednesday’s Christie’s auction was Leonardo da Vinci’s undiscovered masterpiece, Salvator Mundi, auctioned to an undisclosed buyer in an undisclosed location for $450 million. The piece more than doubled the previous record held by Picasso’s Les Femmes d’Alger auctioned for nearly $180 million in 2015. And it left an unanswerable question: what is an appropriate price for a picture of the savior of the world painted by the world’s greatest mind? As an endless parade of sleek black cars deposited their guests at the entrance to Christie’s in Manhattan, the casual mingling and chatting with old friends in the lobby that typically precedes an evening sale was nowhere to be seen. Instead grandes dames in fur and their husbands in bespoke suits made their way briskly upstairs to secure their seats, only pausing for a quick double kiss here and there; that night, their friends became the competition. Bidding began at a now-paltry $90 million. Hopefuls from the seated crowd, happy to shoot their paddles skyward when bidding stalled briefly around $150 million, became dejected spectators as the da Vinci inched steadily higher. At 15 minutes, three tenacious bidders remained, represented at the phone banks by Alex Rotter, Christie’s co-chairman; François de Poortere, head of Old Masters; and Loic Gouzer, co-chairman of Post-War and Contemporary Art. The bids dwindled to increments of $5 million, then down to $2 million. The audience, wide-eyed in disbelief, responded to Pylkkänen’s raise of the gavel like violinists to a conductor, iPhones raised to capture the historic moment. “$350!” Rotter called out, as the crowd gasped—the bid had jumped by $18 million. Pylkkänen repeated the bid, as if in disbelief himself, and searched for the next price to name, though now it was impossible to predict. “At 350 million and looking for . . . another bid please, François,” he said as the crowd laughed. Minutes later, the muted whispers of minutes before yielded to audible guffaws of disbelief as Pylkkänen brought down the gavel for the final $450.3 million bid from Rotter’s mystery client. “I’ve sold four pictures over $100 million at Christie’s, broken many records, but for me this is the ultimate privilege—the absolute zenith of my career as an auctioneer,” Pylkkänen said afterwards. “I should hang up my gavel,” which, he says has sold over $10 billion dollars of art in its time. BP, Shell, Statoil, and several reputable banks and trading houses have announced the creation of a blockchain-oriented consortium and venture. The group aims to create a commodity trading platform. Oil majors Royal Dutch Shell, British Petroleum (BP), and Statoil and a group of banks announced on Monday they had joined forces in a new venture seeking to launch a commodity trading platform based on blockchain technology. The partners expect the platform to go live by the end of next year. The consortium includes trading houses Koch Supply & Trading, Mercuria, and Gunvor, as well as banking institutions ING, Societe Generale, and ABN Amro. Mercuria is a Geneva-based commodity trader focused on the energy markets. It has been an active supporter of blockchain adoption, believing the technology could speed up processing and reduce trading costs. Bell added there had been previous attempts to create an energy trading platforms based on distributed ledger technology (DLT) but they had all failed. However, the support of BP, Royal Dutch Shell and the banks bodes well for the new plan. “[This project] may have more success than if it were an independent party trying to convince oil and gas companies to make use of it,” said Bell. The consortium is now working with regulators to obtain approval. The companies said that the venture would operate independently. We reported earlier that Societe Generale, one of the members of the new energy-oriented consortium, has joined another group of banks that aim to facilitate blockchain cross-border commerce across Europe.